SHE HAD THE FEVER AND SHE HAD IT BAD! Katie Casey is one cat who knows what to do with a bat, and when she heads out to Sluggers Stadium to see her favorite team in action. It's a standoff between the big bat of Crocodile and the trick curve ball of Giraffe, and the crowd is ready for a dandy duel between this duo. In rhyming verse, this frame story leads into the famous words of the song "Take Me Out to the Ballgame" which becomes the narrative of the big game. 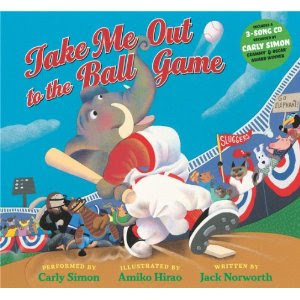 Big, vivid illustrations by Amiko Hirao take youngsters through the game, and Grammy winner Carly Simon's CD performance of the famous song in Take Me Out to the Ball Game (Imagine, 2011) make this one just right for singalong fun. Pair this one with Brian Lies' Bats at the Ballgame for big time ballgame story times.